Fill a cocktail shaker with ice then add vodka, triple sec, cranberry juice and lime juice. You can vary the amount of lime to taste. Shake the cocktail shaker for about 30 seconds until well chilled. Then, strain into a martini glass. Garnish with orange peel/twist, or lime wedge. Combine rum, vodka and pineapple juice in a drink shaker. 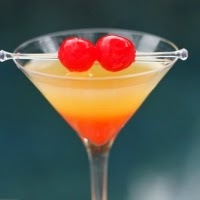 Pour in a martini glass, add a touch of grenadine in the middle. Mix all the ingredients in a cocktail shaker with ice. There are many ways to make a chocolate martini. You can pick your favorite spirit such as light rum, vodka or brandy as a base spirit to mix with a chocolate liqueur. If you're looking for a fruity taste, pick a flavored vodka or rum such as citrus or raspberry. For a sweeter taste, use vanilla flavored vodka or rum. 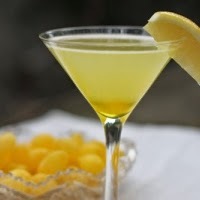 To garnish, coat a rim of martini glass or a swirl a chocolate syrup in a glass. Chocolate flakes dropped on top make a nice touch as well.